Vivian McEachran has battled low expectations her entire life. As a child, she was told she would never have her own family. As a young adult, she was told that she shouldn’t expect to work because of her intellectual disability. Christy agreed to hire Vivian, who she already knew as a customer. The relationship has blossomed and the two women are clearly fond of one another. “I like to keep my home clean,” Vivian said. “So this doesn’t seem different. And at home I clean up after men, which is the same here.” Vivian takes pride in her work. She finds items that are broken in the building, and quickly reports them to Christy. Vivian is careful and precise about her job. 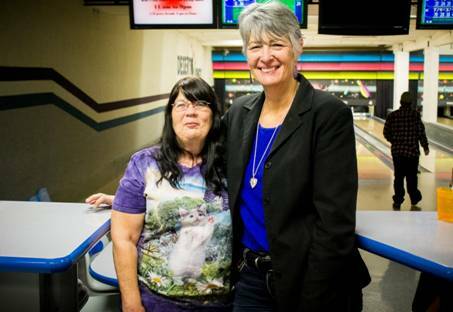 The fact that Vivian cares about the bowling alley makes her irreplaceable to Christy. Vivian said her job allows her to buy things she needs, like curtains for her house. And getting free bowling games as an employee doesn’t hurt either. “I need to get out in the community,” Vivian said. “I get to meet people, and make some money too. 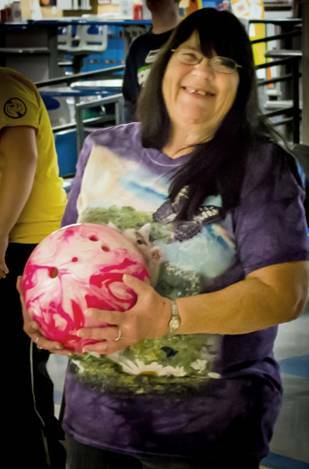 After our interview, Vivian bowled a few rounds with her team. Soon her husband arrived to drive her back to their home in Irrigon (a small town near Hermiston). By all measures, Vivian has a full life, complete with the marriage, children and job she was once told were impossible to achieve.